How Long Before Facebook Has More Traffic Than Google? 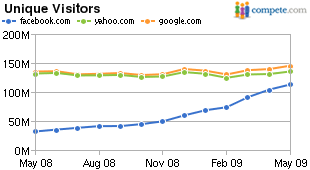 After looking at the Compete.com graph that shows Facebook’s explosive growth, I can’t help but ask the question: how long will it be before Facebook actually has more traffic than Google? I say Google because I think in the very near future, Google will be the only substantial challenger to Facebook. Both Yahoo and MSN (Microsoft) are struggling. So my prediction is that within 5 years, Facebook will actually be generating more traffic than Google – which is also to say that Facebook will be the #1 traffic source on the web.